The Midwest is built on farming. Across the region, it’s not uncommon to hit a farm every few miles, most of which boil down to crops and cattle. But the ever-growing suburbs are starting to encroach on what was once farmland. Farmers are hard-pressed to find enough land to handle 500 head of cattle. That’s where miniature cows come in. They’re smaller — of course. They eat less, which means less land is needed. And they can do anything a regular cow can do, just cuter. “With all of these small acreages, it’s all people can afford to get anymore. 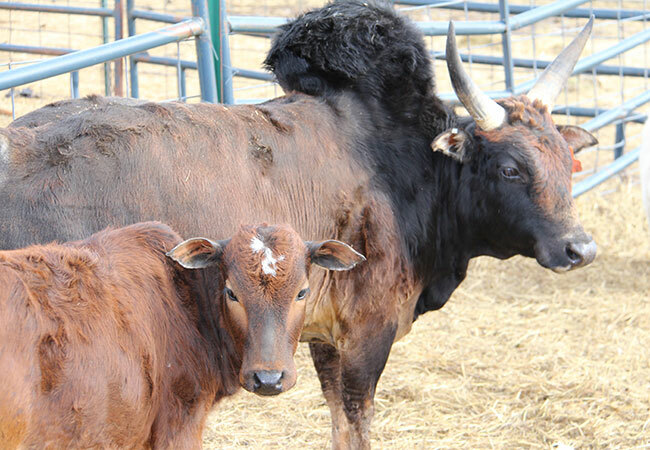 I can raise 30 head of cows on 10 acres and sell them for the same price per pound as the big guys,” said Phillip Vollmer, owner of Vollmer Mini Cattle in South Dakota. Miniature Zebus are the oldest known cattle breed, dating back to 6000 B.C. They’re believed to have originated in parts of India and Asia. At full maturity, Zebu cows weigh about 300 to 500 pounds and bulls about 400 to 600; none of which grow over 42 inches (excluding their hump). An average cow tends to be about 4.5 to 5.5 feet tall, weighing in at about 1,500 pounds. Vollmer got into the mini-cattle business for the novelty of it, but these hardy cows can be used for labor or meat. Beef from miniature cattle has the same market value of their larger counterparts, making them the ideal livestock for beef farms with little room. Like the Zebus, fainting goats or Mytonia goats are smaller than most other goats, staying in the 20-inch range compared to the 30-inch average. The fainters are meat goats, but are primarily kept as pets or novelty animals because they have a funny habit of falling on their face. “We love them because they’re so easy to have. They really don’t get into trouble because they can’t climb fences. They can’t get into things because their muscles just freeze up,” said Ginger Vollmer, partner of Vollmer Mini Cattle. The goats don’t actually faint. They have a condition called Mytonia, which causes the muscles to freeze. Whenever they get excited or scared, their muscles lock up; sometimes they fall over, making it look as though they are fainting. With entertainment comes value, though: The more they faint, the more tender their meat becomes. In Holland during the early 1600s, duck hunters had a problem: Duck calls hadn’t been invented yet. “Duck Dynasty” hadn’t quite made it on the scene. “Call ducks are the reason duck calls were invented. Before they were invented, these are what they used,” Vollmer said. Weighing in at only two pounds, call ducks were perfect. They were easy to carry and loud enough to attract wild ducks in the area. All hunters had to do was tie their feet together so they couldn’t swim away, set them in the water and hide. The Vollmers were once again attracted to this animal because of its novelty and size. Plus, they make great pets … if you don’t mind a little quacking.